Cambridge held on to retain The 2019 Men’s Boat Race, after Oxford came from several lengths down at St Paul’s Boathouse to push their Light Blue opponents to just under a length’s verdict at the finishing line. Cambridge, led by former Women’s Head Coach Rob Baker, covered the famous Championship course in 16:57 to beat Oxford for a second year in a row. Both crews got away cleanly, striking over 40 strokes a minute as they flew past Putney Embankment. In the first twenty strokes, it was Cambridge who stole out to a small lead as the boats swerved into the centre of the intangible lanes that demarcate the course. Cambridge, stroked by Polish Olympian Natan Wegrzycki-Szymczyk, continued to creep away from the Dark Blues though as Fulham Football Ground loomed in the murky grey skies. Umpire Rob Clegg warned Cambridge and Cox Matthew Holland repeatedly as the first bend unwound and Oxford clashed with their opponents. In perhaps the most exciting section of the race so far, both crews could see the whites of each other’s eyes as they veered into mutual water and briefly clashed blades. Working up the second straight of the course passing Harrods Depository, Cambridge continued to try and break the imperceptible elastic that connected the two crews. 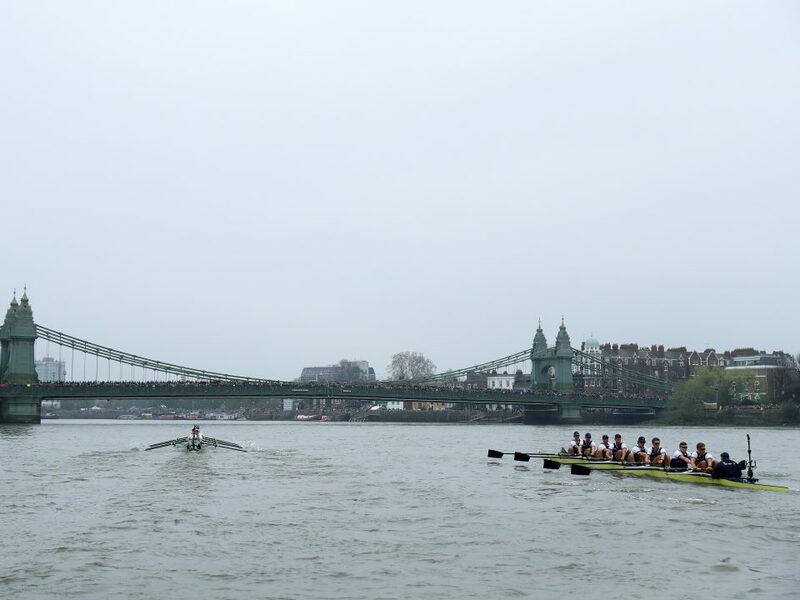 As the race progressed and the Surrey Bend began to reveal itself in Cambridge’s favour, Dara Alizadeh’s boat found their racing groove and, passing under Hammersmith Bridge, had a grip on proceedings. Much like The Women’s Race an hour before, the narrative continued to be written by horsepower, a factor in which Cambridge clearly had the upper hand. Although the margin was not as commanding as 2018 had been at this stage for the Light Blues, they had crossed into Oxford’s steering path and had opened up a lead of around two lengths passing Chiswick Eyot. Despite this, Oxford hung on, motivated by the echo of defeat from last year, the hopefulness of youth and the clash that their opponents had initiated early on. They were, however, running out of water and needed to mount a charge on a Cambridge command which continued to sit at around two lengths. As Andrew Cotter, commentating on the BBC, noted, Cambridge were able to respond to the various moves that the Dark Blues attempted to launch, but the final Middlesex bend beckoned in favour of Sean Bowden’s impressively resilient boat. Surging underneath Barnes Bridge, Cambridge were again warned for their steering but the tempo was high, the rhythm lively and the power geared to peak as the final stages of the race unfolded in front of thousands assembled on the bank.